It is central principle of Moben Global Inc. to keep their FOSJOAS electric two wheel self balancing scooter user-friendly and customer-oriented. From the establishment on, Moben Global Inc. has been doing likewise. The final aim of being user-friendly and customer-oriented is to offer a comfy ride to millions of scooter-lovers. Therefore, Moben Global Inc. is sticking to ergonomics all the time. Under the guide pf ergonomics, Moben Global Inc. has been improving its design of FOSJOAS intelligent self-balancing scooters. A tiny modification to a detail, in the eyes of Moben Global Inc., is of great importance. Today, Matt will go into the details about the comfortable design of FOSJOAS latest model-U3. According to the description made by Matt, the lever-equipped FOSJOAS two-wheeled intelligent scooter U3 gains the compliments about its consideration by means of thoughtful design on its handlebars. Yes, the handlebars. It sounds a very small thing but fulfils the key functions. When Matt gave his first touch to the handlebars, they felt soft and bouncy. The threaded handlebars offer a strong friction that goes a long way towards preventing slip. The shape of holding of hands makes it easier for Matt to hold on. Matt said, once he touched the comfortable handlebars, he thought he could not live without it. He took to the whole bodywork. Of course, it is not the whole story. 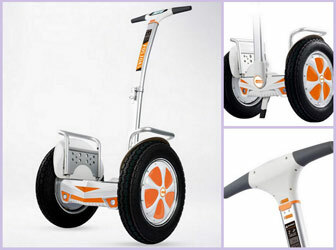 Another thoughtful design in FOSJOAS U3 electric unicycle is its front-amounted wing. FOSJOAS U3 is positioned by Moben Global Inc. as the personal ATV, intended for the off-road ride. Considering its position, it is naturally to be used on off-road terrains. Watt had been concerned that FOSJOAS U3 was subject to the dirty and muddy water which tended to mar the inner circuit of the scooter once permeating the shell. However, the wing of FOSJOAS U3 came in handy and it shielded FOSJOAS U3 from these muddy water, effectively protecting the bodywork. The thoughtful design won over a great support and likings from a host of customers like Matt.